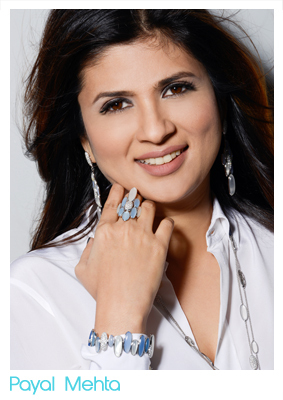 Payal Mehta, the founder of Payal New York, is an independent jewelry designer specializing in bespoke fine jewelry. She also produces a handful of fresh, easy-to-wear fine jewelry collections based on inspirational, tailor-made themes with stones and motifs that speak directly to women’s spirit and natural inner strength. The daughter of a jewelry designer, Mehta tried her hand at many things before embracing jewelry design herself. As a student, she studied math and physics while fantasizing about becoming an interior architect. Although she eventually married a diamond merchant, she continued her studies in art and history while raising two daughters in New York. She became a certified chef at the Natural Gourmet Institute in New York, studied model drawing at FIT, and earned a diploma at the New York School of Interior Design. Coming full circle and embracing jewelry design was a journey of self-discovery. “I realized that I wanted a creative outlet to define my universe,” Mehta explains. In 2009, she fleshed out a concept that became Payal New York. “A woman’s individual personality is her most important quality. My idea was to design jewelry that would speak to a woman’s character and reflect her spirit while remaining easy – jewelry is meant to be worn, not hidden in a safe,” she observes. In 2015, Payal was selected to be the official jeweler to Le Bal des Débutantes, the first independent designer – and first woman – to be so honored. For that event, Payal New York created special, one-off pieces for every debutante to reflect her unique personality.